The NOAA (National Oceanic and Atmospheric Association) Educational Partnership Program with Minority Serving Institutions Undergraduate Scholarship Program is accepting applications. Competitive applications: (i) address the NOAA mission; (ii) have resume and personal statements that are crafted to be relevant to the NOAA mission, and (iii) have recommendations that are well developed and made relevant to the NOAA mission. What: Provides scholarships for two years of undergraduate study. 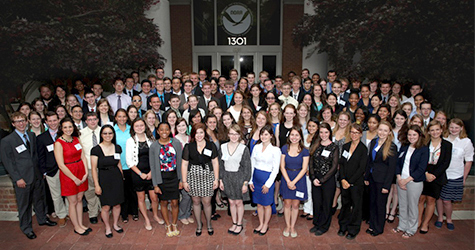 Who: Rising junior undergraduate students majoring in Science, Technology, Engineering and Mathematics (STEM) fields that directly support NOAA’s mission. Students receive total awards valued at up to $35,000 in total support during their junior and senior years. Students complete a nine week paid summer internship at NOAA in Silver Spring, MD, between May and July of the first summer. During the second summer, students complete paid internships at NOAA facilities across the country. During the summer internships, students are paid a stipend and receive a housing allowance. Student scholarship recipients attend a two-week orientation at NOAA in Silver Spring, MD, and begin their first summer internship in early June. At the end of both summer internships, students present the results of their projects at an education and science symposium in Silver Spring, MD (travel expenses paid).